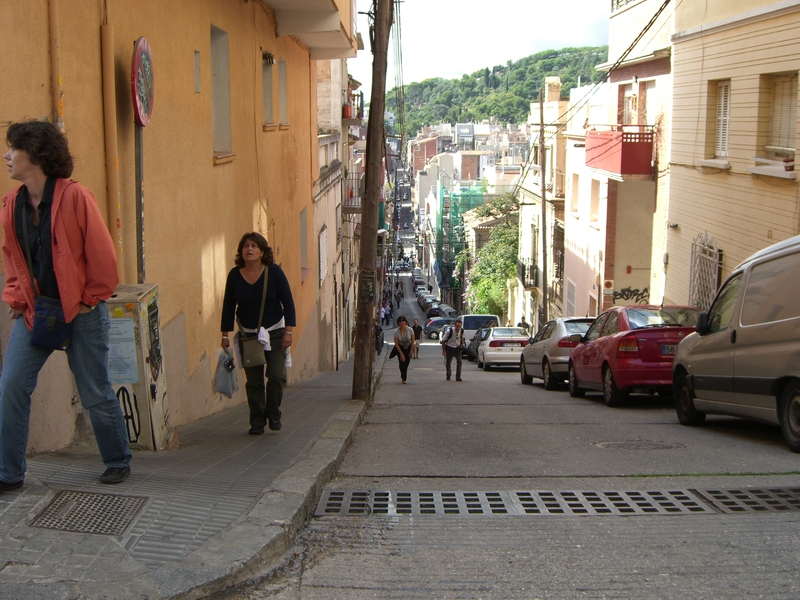 There are two routes you can take to Parc Guell in Barcelona, the short, preferred one or the long one with the steep grade of incline. We chose the short one; we’re no dummies. We were doing well until we left the subway station. There was some major road construction right outside the station exit. There were detours and temporary pedestrian walkways. We followed the signs and checked our maps but somehow ended up traveling in the wrong direction. Our only recourse was to cut a route across the hill and enter the park from the back. 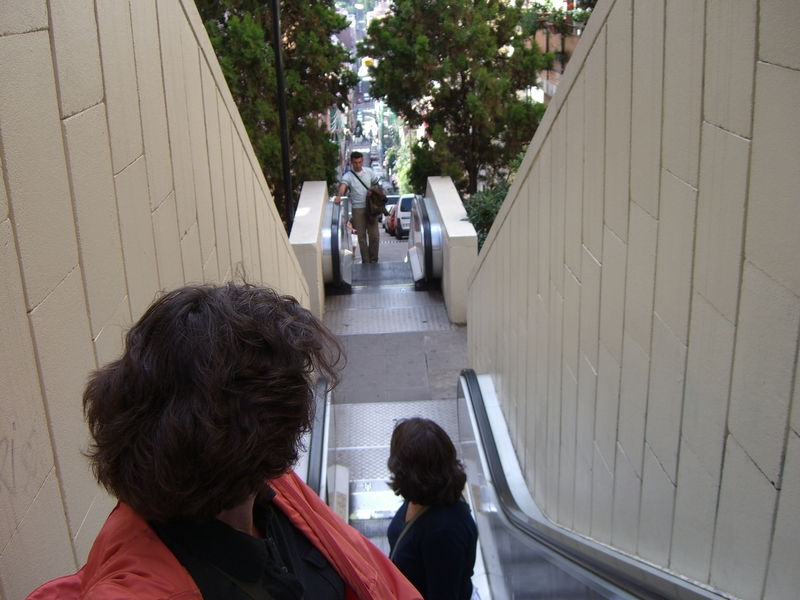 We knew something was up with our new route when the road ended and escalators began. Yeah, that’s right, they replaced the road with escalators. That’s how steep it was. At least it beat walking the hill. 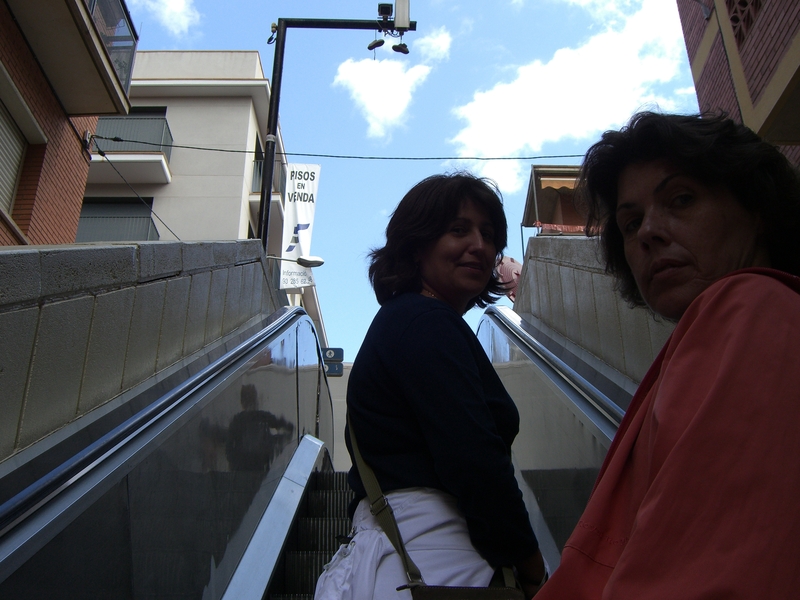 Come to find out, the escalators wouldn’t take us the entire way up the hill. Want to see agony? Check out the couple about 30 yards down the hill. The woman is struggling. I can’t tell you how happy we were when another set of escalators showed up. Eventually, we made it to the park. I could have easily written about the park but others have done that. I thought the journey was a little more interesting. I really liked the energy that came out every night in Barcelona. The streets were literally filled with people. Everyone seemed to be out for a walk or headed to a late night dinner. Although the sidewalks were full, the feeling was comfortable. You didn’t get that big city, shoulder bashing vibe. Unlike the suburbs where I live, being outside on the streets in Barcelona after 10pm was fun and I felt relatively safe. About 100 feet from our apartment building was the Placa Reial. Placa is the catalan word for plaza. The Placa was lined with restaurants that served food until all hours of the night. 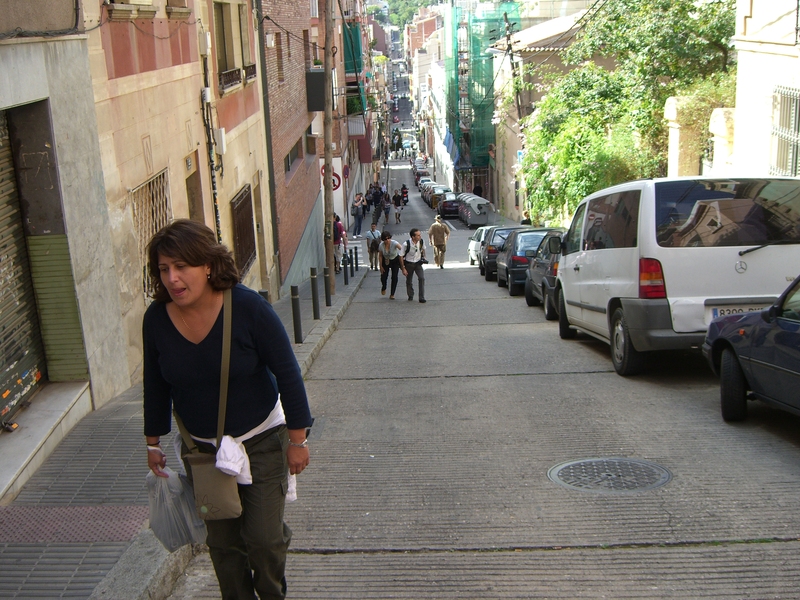 Our apartment was located in the gothic quarter where the streets were narrow and alley-like. There were some interesting characters that hung out near our apartment. The wheelchair guy in this next video was having quite the argument with … someone. Each night after the restaurants were shut down and the trash was picked up, the street cleaners come through and washed the alley way and placa. For the amount of people that moved through the area, the streets were exceptionally clean. Check out the lanterns hanging in each archway around the placa. Then there’s the Red Hat Society ladies and the street guy who didn’t want me to film him. I think he was looking for a fight. I was clearing up some space on my hard drive and ran across this video. 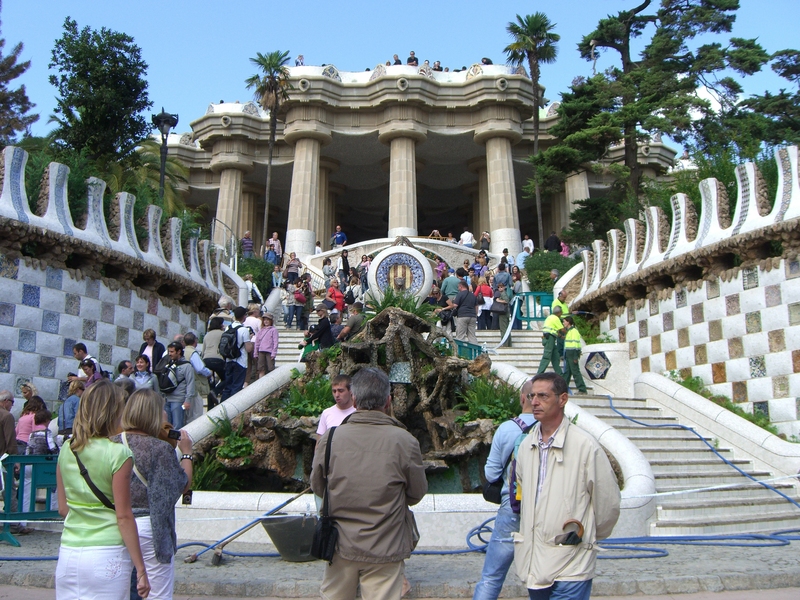 It contains some great Barcelona memories like riding the Barcelona Tourist bus, seeing wonderful architecture, walking next to the old city wall, having a danish and coffee at the Cappuccino, and eating dinner at the Estruch cafe across the placa from the Barcelona Cathedral. 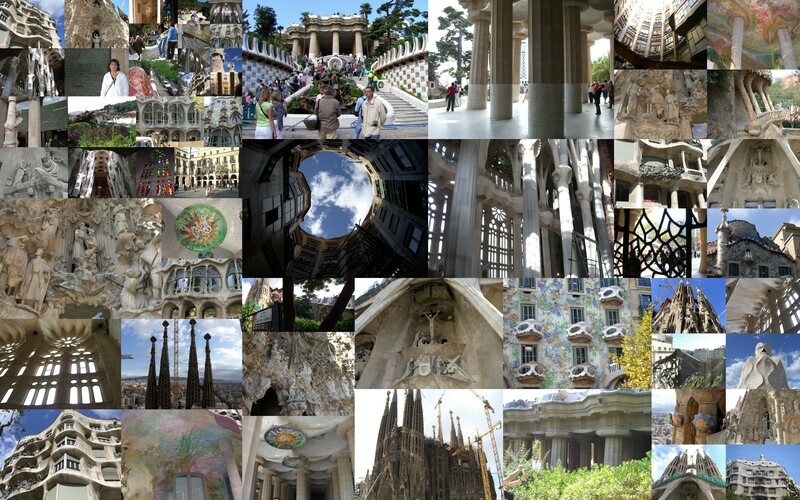 Just some of the many pics I took of Gaudi’s work. Click the image to enlarge. Here’s the situation. We’re in Barcelona, right. It’s October 2008. 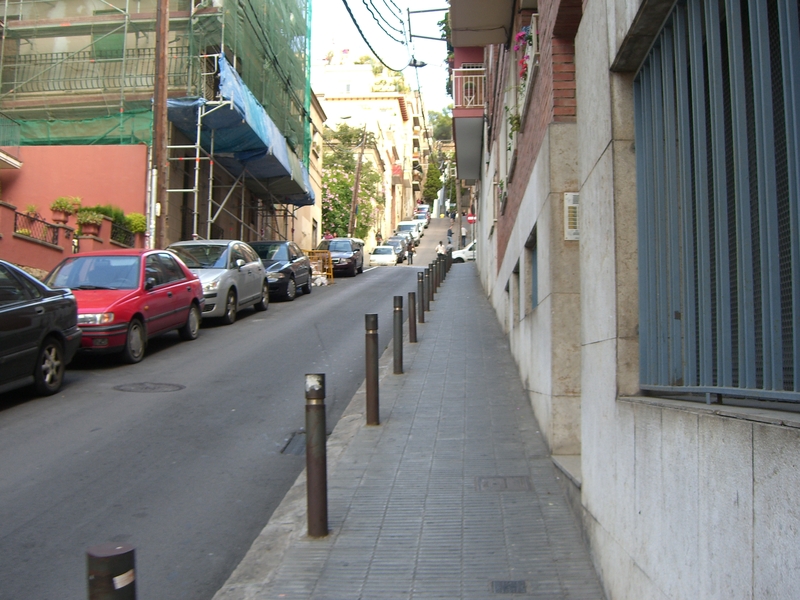 We’re walking down the sidewalk in front of the El Corte Ingles department store. The store on Placa de Catalunya to be exact. Someone we don’t know, a stranger, is sitting at the bus stop. 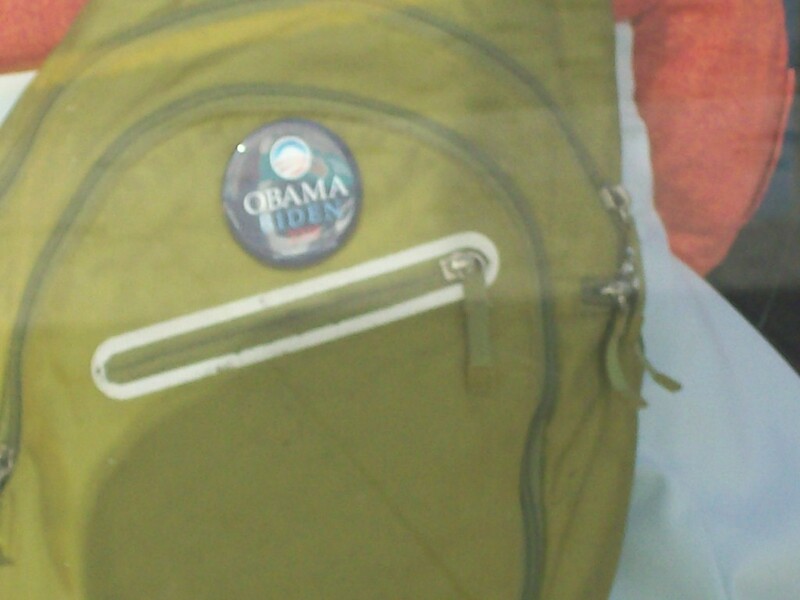 Vic spys this button on their backpack.